Deadstock is the stock in the warehouse that has been not used for a long period of time. It is calculated by multiplying the dead stock and the current price. If total usage is zero they are termed to be no moving rather dead materials. Dead stock is the obsolete stock which you cannot use further. T.code MC50 is used for the Deadstock movement. 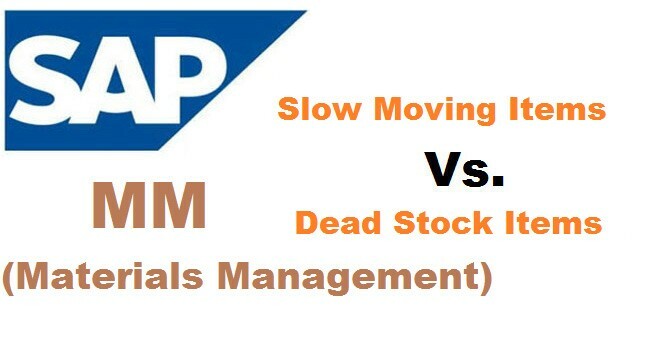 What is Slow Moving Stock? Slow moving items are the materials which are consumed less or not at all over a long period of time. The slow moving stock is the difference of total usage value and the total valuated stock of table S031. Total usage will be totally planned and unplanned consumption. Finding out the slow moving stocks and no moving stocks will be extremely useful in reducing the inventory carrying costs because you can determine which stocks are not required and, if necessary you can remove them. T.code MC 46 is used for Slow moving items based on the no of days. The transactions you mentioned provides the information about the materials respectively.